User can change the layout (view) either as “Expanded”, “Compact” or “List” by clicking button. By default, user status details are displayed in expanded view. 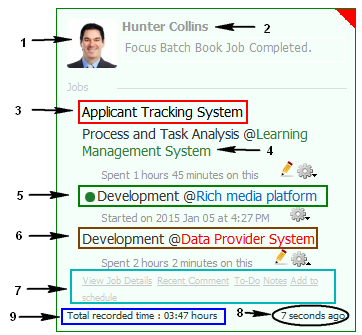 Job Information Status Box provides the summary of work done by user within the day. Below are the main components of it. Scheduled job – Not work started. Scheduled job – Work started. Currently working job – Users currently working jobs are indicated by icon. •	Add to Schedule – To add job to user schedule. This action is enabled for unscheduled jobs only. This shows how long ago user log-in to the application. This shows the total amount of time user worked on jobs within the day. To add own private notes to your job tasks. 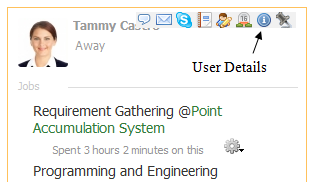 Step 1: Go to “Status” tab -> Click on icon in the Job Information Status Box. Step 2: Enter the “Title” of the note and type your message in the “Message” text box in the below screen. 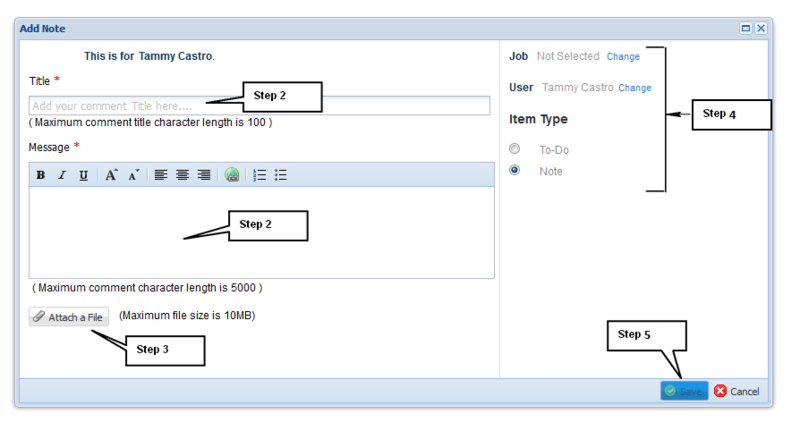 Step 4: User can change the “Job”,” Type of Task”, “User” and the “Item Type” of the note. Step 5: Click on button to save the note to the database or click on button to cancel the operation. This option will redirect you to “My Activities”. In “My Activities” window, users can add working job tasks/ activities, change working job, delete job or can comment on jobs. Attach a Milestones & Event to a specific user. 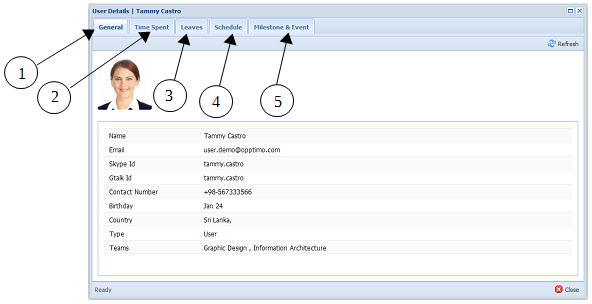 Step 2: Fill the necessary fields in “Create Milestones & Events” window and click button. Refer “Milestones & Events” section on this manual for detailed steps in adding “Milestones & Events”. This option enables users to view their user details, time spent on each task (by date/ by jobs/ by task), leaves and schedule of work. 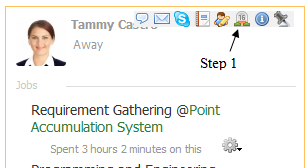 Step 1: Go to “Status” tab -> Click on icon. 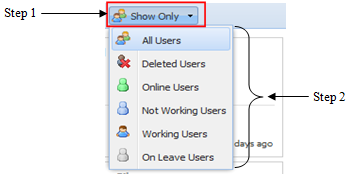 Step 2: User can view general user account information, leaves, and schedules of the log-in user from below window. General – To view user account details of log-in user. Time Spent – To view amount of time spent by log-in user. Spent time can be filtered by “By Date”, “By Jobs” and “By Tasks”. Leaves – Provide summary of leaves taken by log-in user. Schedule – Provide job schedule of log-in user. 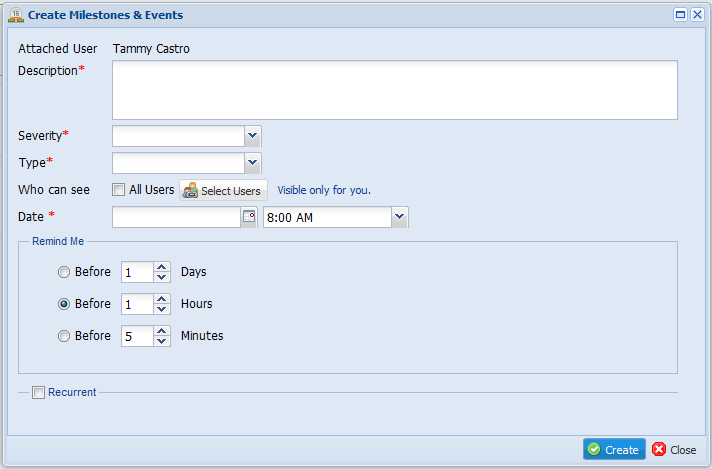 Milestone & Event – This option provides the facility of creating milestones & events for specific user. 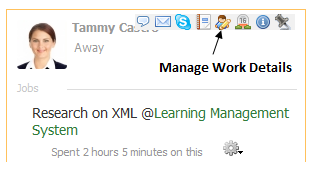 Step 1: Go to “Status” tab -> Click on icon in the Job Information Status Box of the user you wish to message. Step 2: Type your message title and message in the text area displayed in below screen. To attach any files, click on button. Step 3: Click on button to save the note to the database or click on button to cancel the operation. 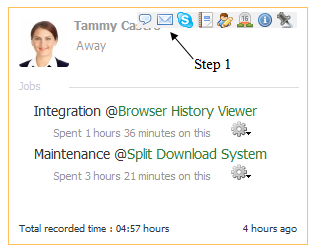 To Skype with other users, click on icon in the Job Information Status Box. To use this facility, you must have installed Skype in your computer. Step 1: Go to “Status” tab -> Click on “Filter by Team” drop-down option. Step 1: Go to “Status” tab -> Click on “Show Only” drop-down option. Step 2: Select the group (i.e. All Users/ Deleted Users/ Online Users/ Not Working Users/ Working Users/ On Leave Users) of users you wish to filter from the list. 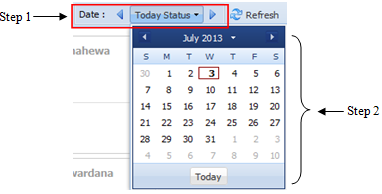 Step 1: Go to “Status” tab -> Click on “Date” option. By default the system display user status for current date. Step 2: Select the date you wish to filter from the calendar. 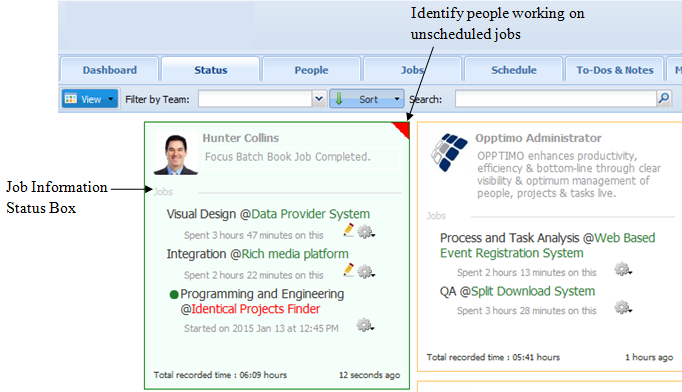 To sort user’s status by their “Name”, “Last Update Time” or “Total Time Spent” on job tasks / activities. 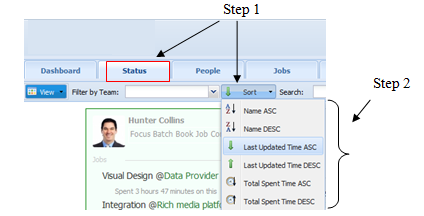 Sorting can be done in Ascending (ASC) order as well as in Descending (DESC) order. Step 1: Go to “Status” tab -> Click on “Sort” drop-down option. Provide the facility of monitoring the status of tasks/ activities of selected users. You can select users for pin, unpin users and filter pinned users. Step 1: Go to “Status” tab. 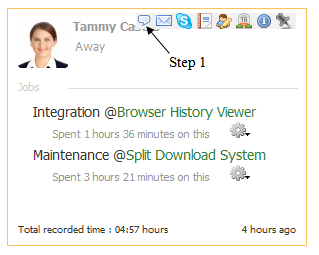 Step 2: Click on icon on the user detail box. Use option to filter pinned users. Step 1: Select users need to unpin. 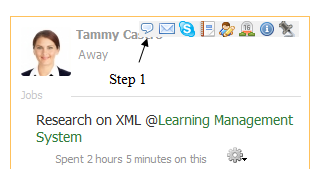 Step 2: Click on icon on user detail box.